Always interested in alternatives to buy and hold, Vance has generously allowed me to describe my stock market trading method here, and to post its buy and sell signals as they occur in the future. This information is for educational and entertainment purposes only, it will never be a recommendation to buy or sell anything. But I believe that it will prove interesting to consider and watch over time. The method went to 100% long on 30-Nov-2013 with the Russell at 821.92. Went to 50% short on 18-July-2014 at 1151.61 based on the Russell 2000 dropping below the sell threshold and market breadth measures. My method is similar to the 4 percent method on the Value Line Geometric Index, as first published by Ned Davis in the early 1980s. For those unfamiliar with this index, it is described here. Davis’s algorithm simply bought long any 4% or greater move up in the weekly closes of this index and sold and went short on any 4% or greater move down in the weekly closes. His algorithm captured a good portion of every major move up or down, but, typical of a trend following method, suffered a number of whipsaw losses, primarily due to false sell signals. I tried a number of ways to reduce these and found two that worked well. The first uses a trend line. By dynamically constructing this line and deferring action until the market penetrated it, the method reduced whipsaw losses significantly, with little effect on total gain. I added this feature to the method. The second improvement concerns short sales. Davis shorted on all sell signals. Unfortunately, most did not end profitably. Using market breadth (advancing and declining issues on the NYSE) was found to better identify conditions for a short. My first pass modification identified every major downturn since 1961, except the plunge on 9/11/2001 (which was hardly an economically based event), and prevented shorting of many of the smaller corrections. I added this to the method, unchanged from my first attempt. 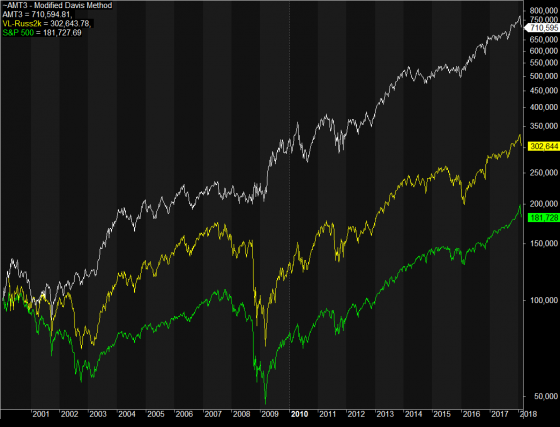 The farther an index moves (in percentage terms), the better it is suited for trend following. Davis probably was aware of this and chose the Value Line Geometric because it did move farther than other indexes available at the time, such as the Dow Jones Industrial Average and the S&P 500. Many small-cap indexes retain this tendency to move farther than their larger cap cousins and are the basis for ETFs and futures contracts. 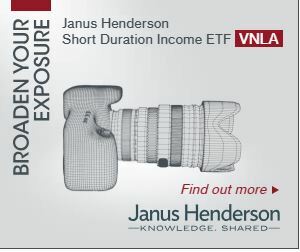 Currently, there are no ETFs or futures contracts based on the Value Line, so another choice had to be made. The data series used by the method begins with the Value Line Geometric because there are no readily available small-cap indexes prior to it. But conversion to another index was required before the Value Line fell out of favor. The Russell 2000 currently is quite popular, so a continuous index was created by using the Value Line until the Russell began in 1979, then splicing the Russell onto the Value Line. The algorithm is controlled by three parameters. Two of these are buy/sell thresholds, and the third is the slope of the trend line. The algorithm could be optimized via backtesting, but a forward test is far better. The typical automated trading method uses (or at least they did, for a very long time) a large number of parameters and the method is optimized by backtesting on a great deal of data to determine the best set of parameter values to use. These methods work fabulously on past data when thus optimized, but soon begin to fail on future (out of sample) data. A forward test, where results are recorded entirely on data that the method has not used for optimization, provides a far better indication of how a method will perform in the future. The forward test began by “training” the algorithm on the S&P 500 data from 1942 through 1960: all possible combinations of the three parameters were applied by the algorithm to the S&P 500 data, and the values that produced the best results were chosen. These parm values then were used for the first trade on the Value Line/Russell 2000 data series, and the result of that trade was recorded as the first result of the forward test. For the next trade, the algorithm was trained by running the Value Line/Russell 2000 data series from its the beginning to the end of the first trade, with all possible combinations of the three parameters, and choosing the values that produced the best results. These parm values then were used for the next trade on the data series, and that result was recorded. This process was continued for all of the data in the series, beginning each training session with the start of the series data and ending at the end of the last trade. 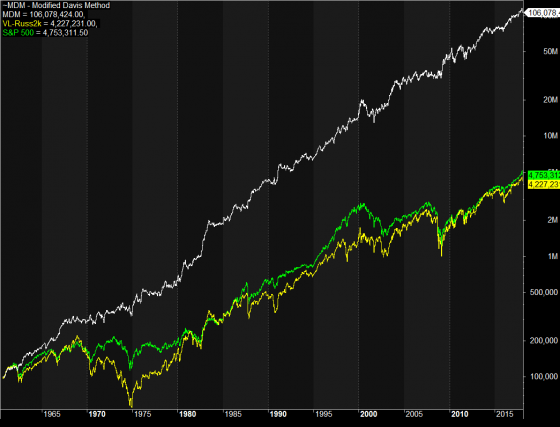 The results are quite impressive: close to 14% average gain per year since 1960, with a maximum drawdown on closed trades of about 26%. Dividends and money market interest would boost this annual gain to over 15%. For comparison, buy and hold of the S&P 500 (excluding dividends) averaged 6.5% per year over the same period with maximum drawdown greater than 40%. The accompanying chart shows the results. 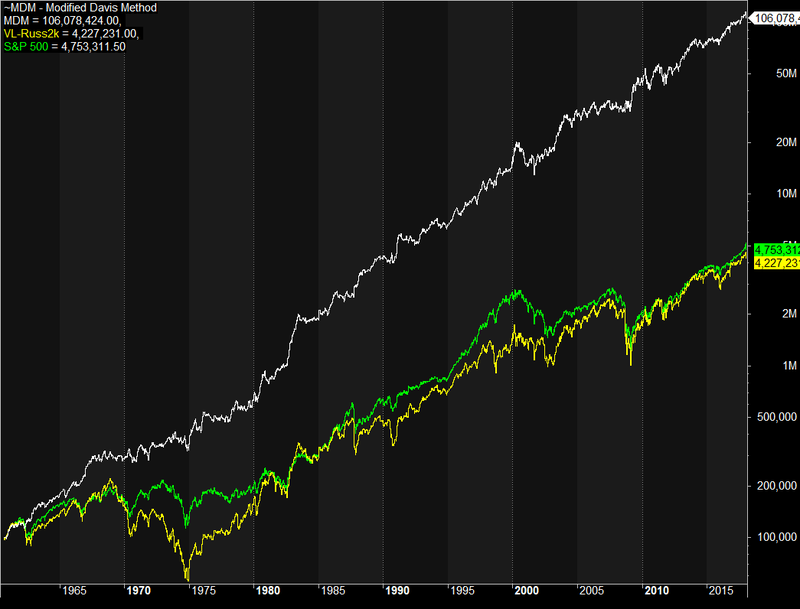 The upper (white) line is the method; the lower (yellow) line is the Value Line/Russell 2000 index. For comparison, the S&P 500 is shown as the green line. These are results through 9-Feb-2018. In the forward test, the method traded about 3-4 times per year, winning on 54% of all trades. Its win/loss or payoff ratio is 3.98. This next chart zooms into the period from 2000 on, with each portfolio starting with $100K. Risk of ruin for this method, as defined in this article, is quite low. The method’s Risk per Trade is difficult to estimate. Its average loss is about 2.8% but its maximum loss has been 7.25%. In 190 trades it had only 3 losses greater than 6%. We must interpolate between the 10% and 5% Risk per Trade tables. Rounding the Payoff Ratio to 4:1 and the Win Ratio to 55%, the 10% table gives a Risk of Ruin of .0438 and the 5%, a Risk of Ruin of zero. So the method’s Risk of Ruin is greater than zero but quite low. I will be posting future trades here as soon as possible after the close on the day they occur, and I hope usually before the open of the next day. Stay tuned if you’re interested.